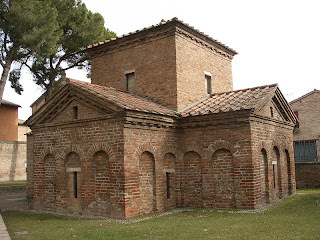 On September 20, 2010 Marsha Ashe and I visited Ravenna, Italy as part of the program of the 39th ILAB-LILA Congress which took place in Bologna. At the Byzantine Mausoleo di Galla Placidia, a Unesco World Heritage site, completed circa 426-450 CE, and considered "the earliest and best preserved of all mosaic monuments, and at the same time one of the artistically perfect," we were privileged to view the spectacular mosaics on the upper interior walls and ceilings of the mausoleum. For preservation's sake light in the room was kept very dim. The mosaics included the so-called Lunetta di San Lorenzo, which presents the earliest surviving image of codices in a book cabinet or book press or armarium-- specifically codices of each of the Four Gospels lying flat on book shelves with the edges of the book blocks, rather than the spines of the bindings, facing outward. 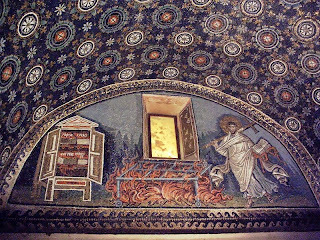 To the right of this cabinet, on the other side of the marble lunette, the mosaic depicts the standing evangelist holding a large cross in one hand and an open codex in a chemise binding in the other hand. This may be the earliest surviving image of a bookbinding in wall art. Clark, The Care of Books (1901) 41.